The second Pretty Postal swap - the Midnight Mail Swap - was dark and mysterious and moody (and oh so fun!) 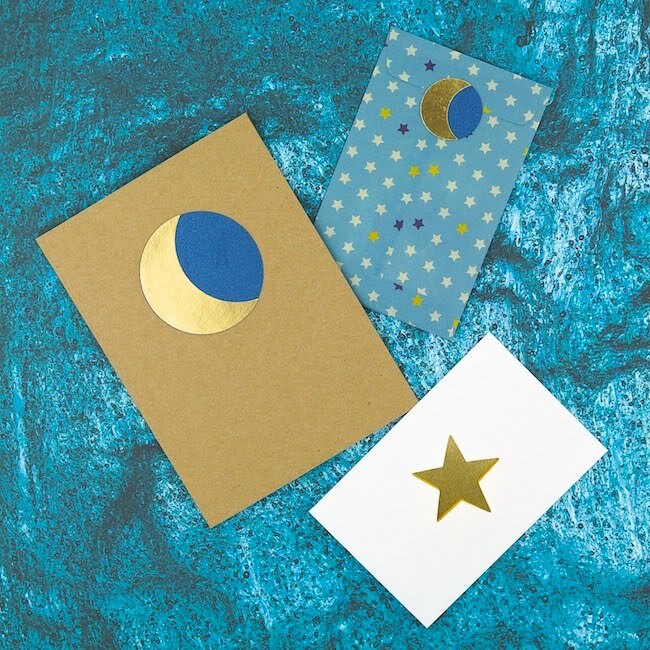 Close to 100 snail mail lovers from around the world exchanged midnight-themed mail with each other - there were witches and ravens and wolves and constellations and many many moons! Here's a look at the pretty mail that I sent and received. You can peek at more mail right here. I took inspiration from the night sky - full moons and golden light pouring through trees and the sound of owls winging through the darkness. I started by making envelopes out of navy card stock, then cut out a leafy pattern and added a metallic gold backing. I topped the handmade envelopes with a watercolour moon. 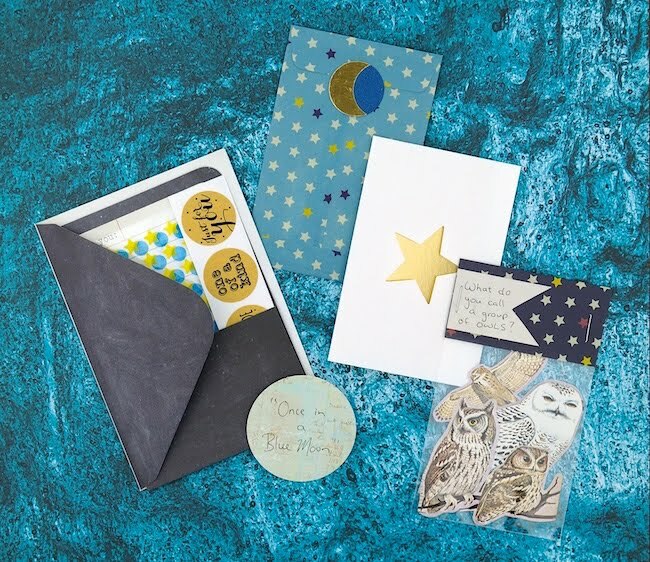 My night sky theme continued inside the envelopes - more moons plus plenty of stars and owls. After playing around with more complicated card concepts, I decided to keep it simple for this handmade card. 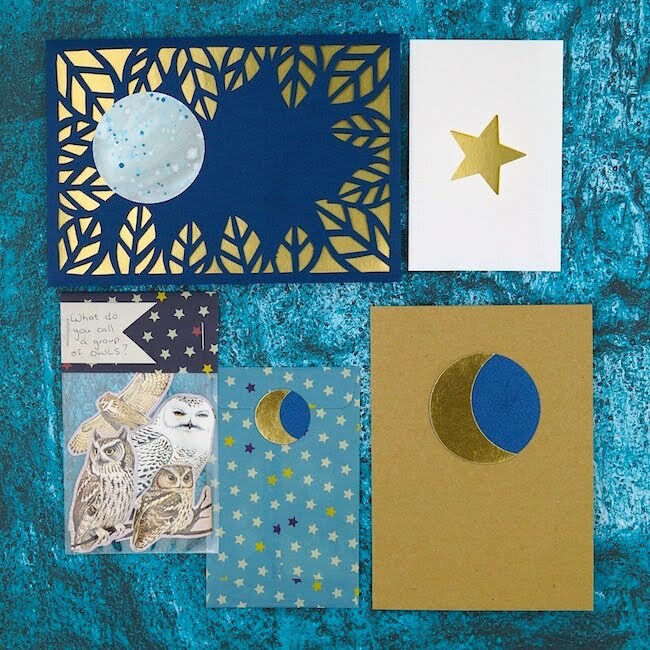 A circle punched from a slightly metallic blue card stock topped with a golden crescent moon made for a graphic and modern look. 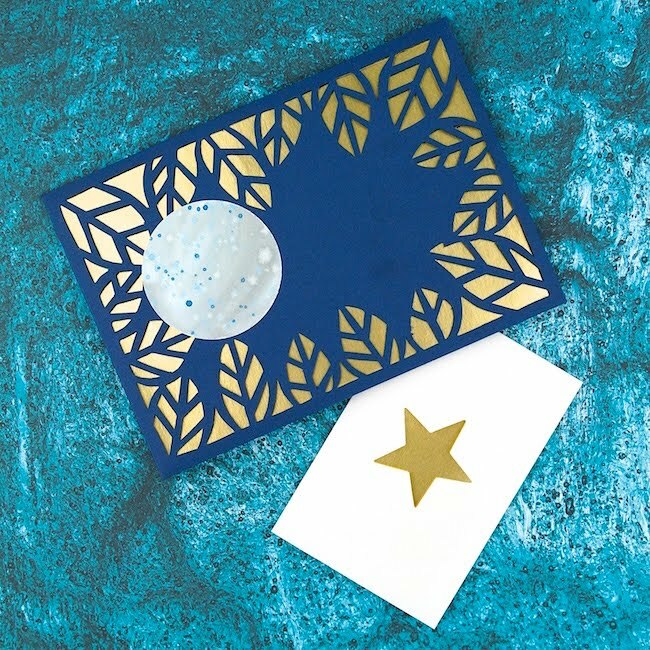 I replicated the same icon in miniature to seal the included starry envelope. As for the extras, I shared a combination of stickers, blank cards and owl embellishments cut from a vintage book. 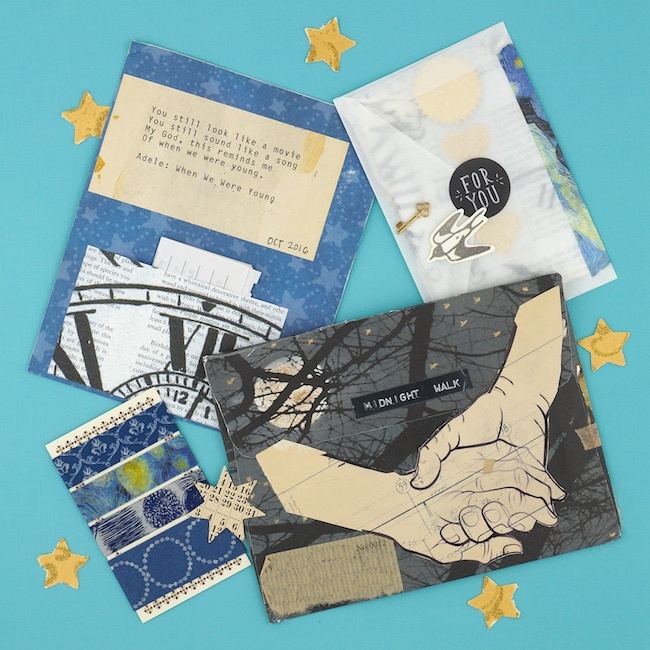 Norma, in Oregon, crafted gorgeous mail inspired by midnight walks - strolling hand-in-hand beneath the stars. And how great is her taste in washi tape?! 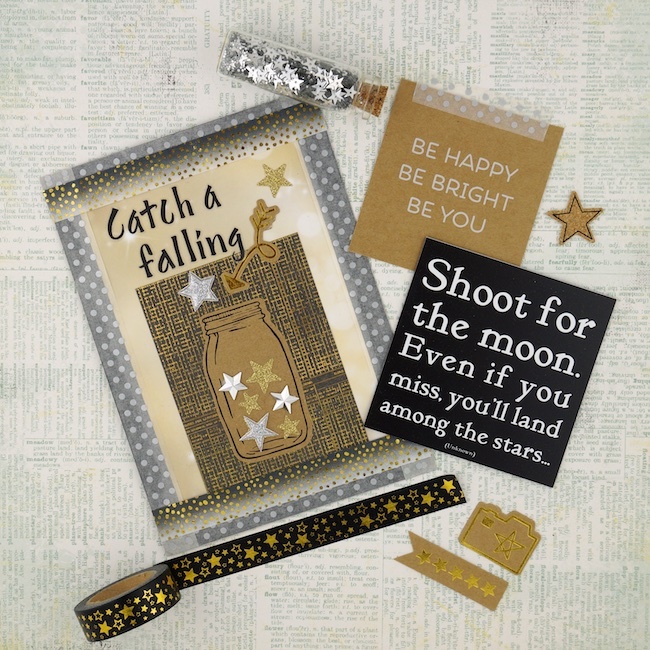 From Shana, in California, beautiful starry sky mail - complete with a mini jar of falling stars. So clever! And Ana, in Portugal, sent a lovely package filled with fairies and full moons. 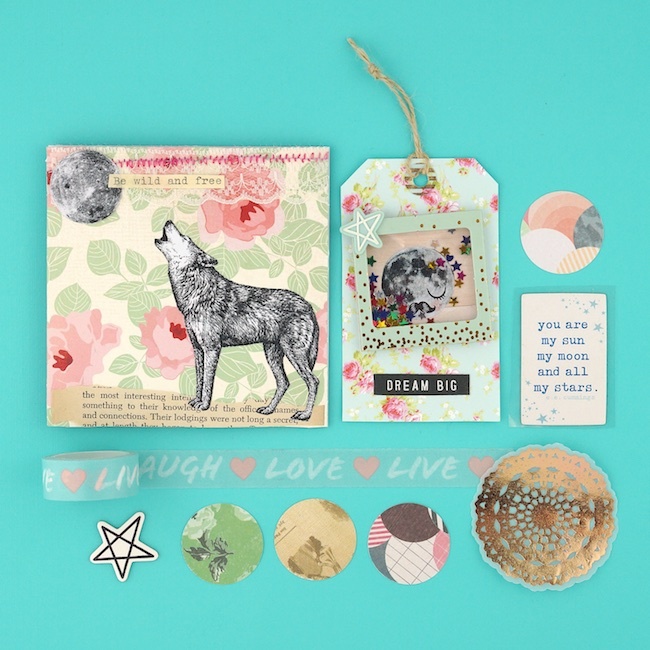 I adored the wild and free wolf pocket and the confetti tag - can you see the man in moon snoozing there? What fun a good mail swap is! I do hope you'll join us for the next one!